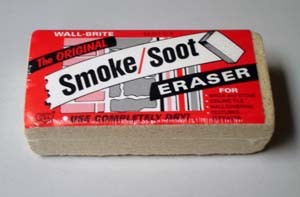 Measures: 1-3/4" x 3" x 6"
This is an exceptional sponge and a must for soot removal. Use it dry to clean any surface - it actually absorbs a tremendous amount of soot/dirt into the cells of the sponge. Made of volcanized natural rubber. It is completely safe and non-toxic. These are known as chemical sponges.